The euro area trade surplus grew again in February as trade flows contracted and imports fell faster than exports. The trade surplus rose to 20.988 billion euros in February from 20.214 billion euros in January. The EMU trade balance has been in surplus for 67 consecutive months and in surplus 69% of the time since January 2000. This is boosted by the dominance of Germany in EMU trade. The German trade position has been continuously in surplus for 320 consecutive months spanning a period of over 26.5 years. To understand the EMU flows better, I break both the export and import sides down into manufacturing vs. nonmanufacturing flows. The presence of commodities, especially oil, in those flows makes them volatile and causes them to obey different rules. The manufacturing flows are the ones that respond best to exchange rate changes, growth differences and overall competitiveness changes. In February, EMU manufacturing and nonmanufacturing flows behaved about the same with both falling by about 2.3% on the month. However, the sequential growth rates (12-month to six-months to three-month) show a steady deceleration for manufactures while nonmanufactured goods have a less delineated pattern. For EMU imports, manufactures fell harder than nonmanufactures in February, dropping by 3.6% as nonmanufactures fell by 1.8%. For imports, there is also a clear sequential rate slowing for manufactures without clear patter for nonmanufactured goods as manufacturing growth rates slow from 0.2% over 12 months to -6.5% over six months and to -13.3% over three months. 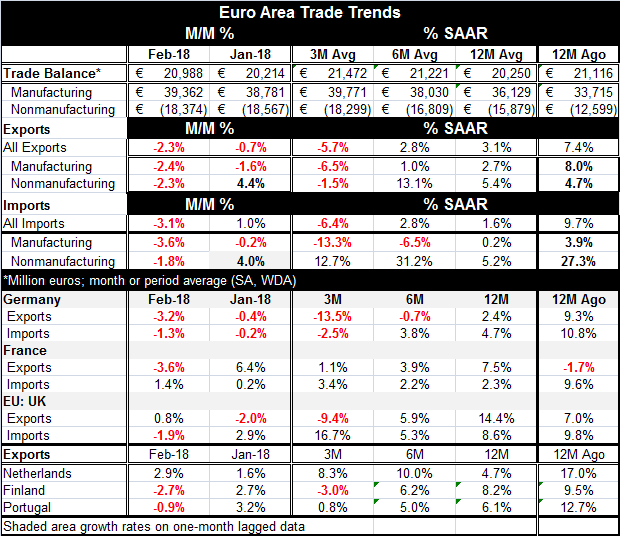 Not surprisingly, the EMU patterns for manufacturing echo the German pattern for overall trade flows as those patterns find both German exports and imports are on a clear deceleration course from 12-month to six-month to three-month. However, the German flows show relatively more weakness in exports than in imports all along the line. France shows a clear deceleration for its export sequential growth rates. The U.K., Finland and Portugal also show clear ongoing export deceleration on this timeline. These slowdowns dovetail with the weakness we have seen the Baltic Dry Goods Index indicating that trade volume has been slipping steadily. We are looking at nominal flows here, but for the EMU we eliminated commodities. And during this period, oil prices have largely been firm or firming so I do not think we are picking up a price effect- that possibility is also made less likely since we are looking at the exports of these European nonoil exporting nations. Trade flows are slowing. It is something to watch. Even Baltic Dry Goods Index continues to fade. There are straws in the air signaling that growth is moving lower rather than higher as global central banks and the IMF believe. There is enough of this sort of evidence that we ought to pay attention to it.